Warm on the Patio …and some food. 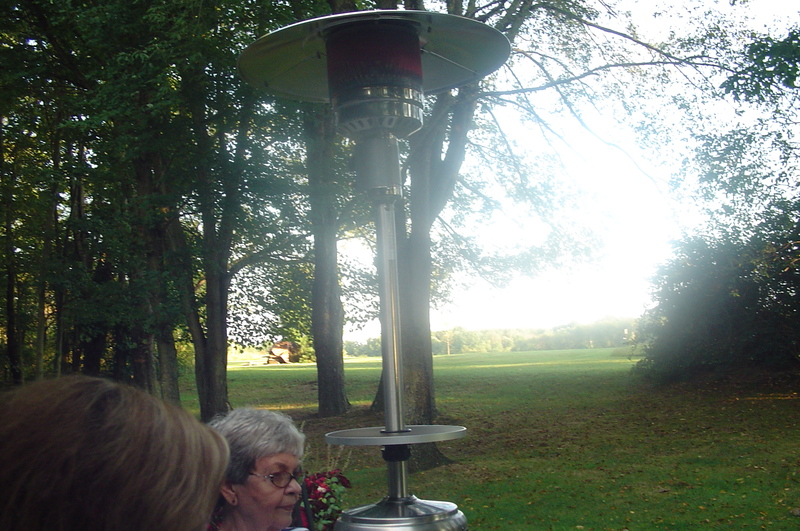 It was a beautiful summer/fall night this evening and we were cozy on our patio due to our new heater. 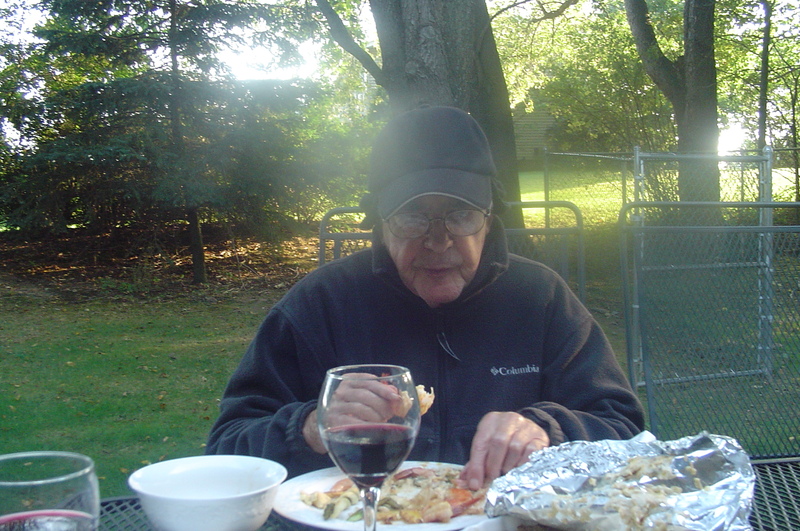 Bob has always wanted a propane heater so we would be able to eat outside even into the fall weather. The grands joined us for dinner tonight. 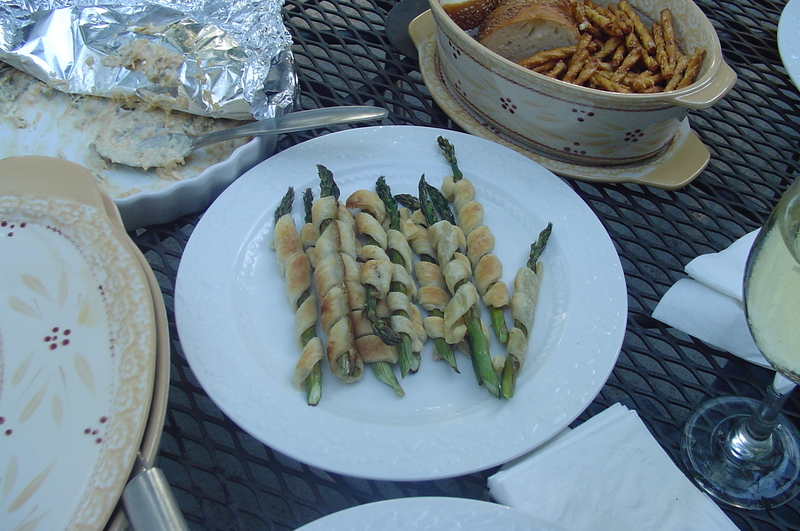 I was going to make Tom’s pot pie with my puff pastry, but then Carolyn & I talked about asparagus wrapped in puff pastry. I had everything for that, so there you go. I made a jalapeno cheese dip for the asparagus. 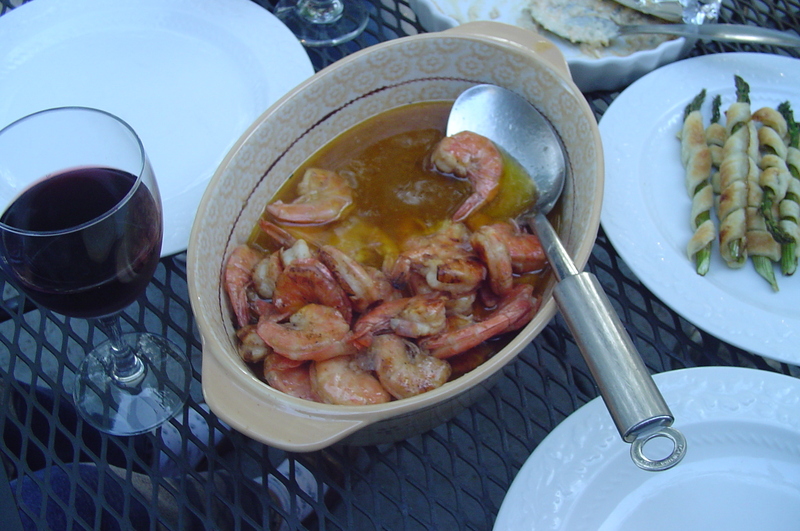 I also made some peel and eat shrimp in a cajun butter sauce. You should have seen GP’s chin! I did buy the asparagus at the farmers market. Does that count for this post? This entry was posted in Dinner, Lunch on September 18, 2011 by andrewsbeth. It was a beautiful night! I spent it in the yard. You have to share your cheese dip, I love the wrapped asparagus at the Bistro!! Me too! I want to know how to make the jalapeno cheddar dip too! Where did you get the big heater? Casey and Joe had them in the barn at their wedding, and those things kept everyone toasty and cozy! It was a beautiful night. We got the heater at Lowes. It is great! As for the chees dip, so easy and really good. Quite spicy. Also good to dip pretzels in.It is called Insanely Amazing Jalapeno Cheese Dip-allrecipes.com. 1 (4oz) can diced jalapeno peppers, 1 c. shredded parmesan cheese, 1/2 c. shredded cheddar cheese, 1 c. mayonnaise, 1 (4oz) can chopped green chilies. The recipe says to bake it in a round sourdough bread at 350 degrees for 30 min. I just put it in a small casserole dish. Either way would work. It goes great with the asparagus too. How cool that you have your own heater! Get B Man over there and you guys are the new Ricco’s! It is nice. And puts out a lot of heat! I am absolutely drooling over the shrimp. I’d probably be right there with GP, dripping butter sauce. That sounds amazing.